Do you know how to properly clean your oral device? I didn’t and I’m married to a dentist. We had a patient stop in our office the other day asking how to clean her TAP 3 sleep apnea device. 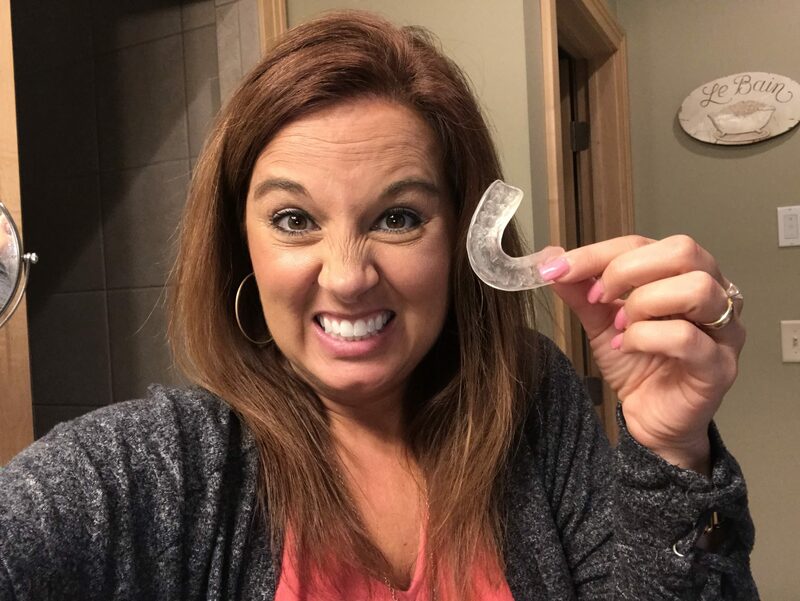 She said it was starting to smell and taste bad after wearing it nightly for a few months. It’s easy to sympathize – those qualities are not incentives to wear the device every night. One staff member suggested a denture cleaner and the patient said she remembered being cautioned against that. So what is the answer? 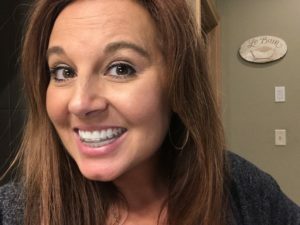 I have a splint I wear at night to treat my TMJ pain. I’ve worn it for years. I usually just rinse my splint with water in the morning and let it air dry. About every week or so, I’ve used my toothbrush, with a little left over sudsy toothpaste on it, to gently brush my splint in the morning. I found out today that toothpaste can be abrasive when used to clean oral devices. Again, what is the answer to a clean and deodorized oral device? A few minutes of intense staff discussion in our lunchroom followed this question, then another staff member jumped on the internet, went to the website for the TAP 3 Elite, and found instructions on proper care for the device. Thank goodness for the internet! Cleaning directions, straight from the TAP 3 Elite website. After our conversation at work today, I will admit I did take a little sniff of my splint when I got home. It wasn’t terrible, but I felt compelled to clean it, just the same. 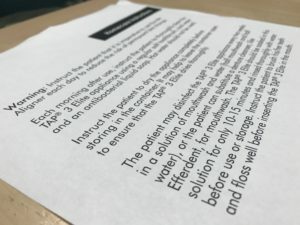 The following instructions are for cleaning a TAP 3 Elite, an oral device used to treat sleep apnea, although we believe this would be a safe method to clean any oral device such as a splint or night guard, mouth guard, orthodontic retainer, or partial or full denture. Use a soft toothbrush dedicated just for this task, cool water and an antibacterial liquid soap to thoroughly clean the device each morning. I know it sounds weird to use hand soap on your oral device, but I tried it and I feel it cleaned my splint really well. 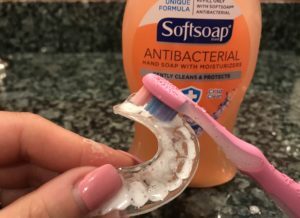 My biggest fear was tasting the soap when I put my splint back in my mouth, but I made sure to rinse it thoroughly and I didn’t taste the soap. Win! The cool water is also important, as you don’t want to damage or distort the device with hot water. Let your oral device thoroughly air dry before placing it in the storage container or case. If your oral device isn’t completely dry, just leave the top of the case open during the day or leave it in a safe place. I usually keep mine on the bathroom countertop or on my nightstand during the day. Every two weeks, disinfect your appliance by soaking it in a solution of half mouthwash, half water for only 10-15 minutes, then thoroughly rinse it with cool water. You can substitute a denture cleanser for the mouthwash, but again only soak the appliance for 10-15 minutes. Timing is key here, folks. You could potentially damage your device if it is left in the cleaning solution for too long. 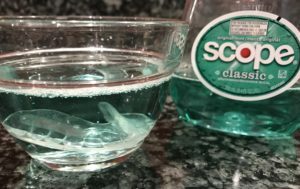 I left my splint in the mouthwash solution for 10 minutes and it came out looking and tasting fresh and clean. Remember: You should always put your oral appliance into a clean mouth. The bacteria on your splint can’t form there on its own. Brush and floss your teeth before wearing your oral appliance each day or night. These actions will help keep your appliance, your mouth and your teeth cleaner. I do feel a little silly for not properly cleaning my splint all these years. Although I was keeping it pretty clean with sudsy toothpaste, I was potentially damaging it with the abrasive toothpaste. I’m excited to sleep with a clean and fresh-smelling splint tonight. Sweet dreams, everyone! Yay! My splint is fresh and clean! And you can bring your device along during your 6 month visit for a real good cleaning.